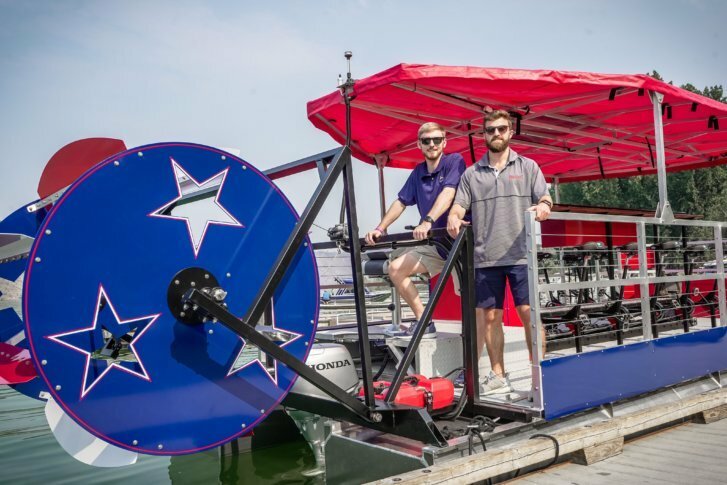 The Potomac Paddle Pub, which opens to the public Oct. 4, combines paddle boats and beer. Paddlers bring their own beer and snacks along for the ride on the 15-person boat. WASHINGTON — A first-of-its-kind attraction in D.C. will combine paddle boats and beer: The Potomac Paddle Pub. Jack Maher and Jack Walten — or “The Jacks” as they’re known — came up with the idea for their 15-passenger boat after seeing similar attractions on land. “We were looking at the bike bars on the street and thinking how cool it would be if this was something you could do on water,” said Walten. Paddlers can bring their own beer and snacks along for the ride. The boat is wide enough to allow passengers to move around the deck and take turns paddling. The Potomac Paddle Pub is environmentally friendly, using only solar panels and the paddlers to keep the boat moving along. “It really aligns with our values for sustainability,” said Walten. When passengers make a reservation, they will also be able to give back to their community. “You actually have the option to round up to the nearest dollar and donate the remainder to Potomac Conservancy,” said Maher. The Potomac Paddle Pub is already a huge success, according to The Jacks’ family and friends. “We’re excited to get people on there and the groups that we’ve had, everybody’s been having a blast,” said Maher. The Potomac Paddle Pub opens to the public Oct. 4.